On our accredited multi-platform Journalism course you will develop the skills for a career in journalism, including reporting, digital production, feature writing and shorthand. National Council for the Training of Journalists (NCTJ) accreditation is recognised in the industry as the best indication that new recruits have the skills and knowledge to become effective multimedia journalists in a busy newsroom. In addition to your degree, you will take the NCTJ Diploma in Journalism, a widely recognised entry-level qualification for professional practice. The course is taught by media industry professionals and highly respected academics who will help you develop key journalism skills as well as critical understanding, academic research and writing methods. You’ll use our industry-standard facilities, which include a 40-station newsroom, multimedia suite, and live satellite news and sports feeds. You will benefit from lectures and masterclasses given by visiting editors, journalists and campaigners. Recent guest speakers have come from Sky News, the BBC, Time Out, the Daily Telegraph, Johnston Press, the Balkan Investigative Reporting Network, Full Fact and Reporters Without Borders. Your placement will give you experience in a professional journalistic environment and help you make industry contacts. Our students have completed placements at organisations including The Daily Telegraph, Stylist, Harper’s Bazaar, Ricochet Productions and Lonely Planet. You'll get out and about, finding and publishing your own stories. Students have interviewed MPs in the House of Commons, visited arts venues and reported from court trials and council hearings. Trips have included the Sky News newsroom, and an expedition to France to practise travel writing. You'll publish your work on our student run website www.overtimeonline.co.uk and, once a semester, collaborate with all year groups to plan and produce a magazine. All of our journalism courses have three main strands – two shared and one distinctive. Core journalism study (newswriting, law, shorthand, public administration, digital journalism, multimedia). A work placement, research methods module and dissertation. Option modules and applied subject modules, which allow you to specialise in an area of particular interest. On top of these core elements, you learn skills in digital and multimedia journalism, which are becoming increasingly central to industry practice. You also take a work placement in the final year so you can experience a professional journalistic environment. Find out all the latest news on our courses, students, staff and research. You will gain a thorough introduction to journalism, learning to write news and features, make podcasts and videos, and use shorthand. You will also study ethics, government, political theory and critical approaches to journalism. In this module you will be supported to produce a self-generated feature article on a subject of your choice. You will reflect on your own work in the perspective of the defining journalism of the past, the audiences, styles and platforms of the present day, and the innovations shaping the journalism of the future. This module develops fundamental skills for news reporting: newswriting, ethical practice and shorthand. You will learn to recogise, select and present news for specific audiences and platforms, and learn the techniques required to write publication-standard articles and apply them in defined scenarios. You’ll learn the theory of Teeline shorthand, develop speed to 60wpm and use it in the production of a news story. You'll also learn to locate news reporting practices in the context of specific regulatory and ethical codes. In this module you will develop a working knowledge and critical understanding of public administration as it affects journalists. This includes central and local government structures. In addition, you will learn the journalistic skills required to make sense of, record and accurately report central and local government activities and issues. This module will introduce you to multimedia journalism. You’ll learn how to produce a stand-alone audio or video package suitable for web. You’ll learn about basic multimedia recording and editing techniques and will develop your audio-visual storytelling abilities on digital platforms. This module will introduce you to key debates in journalism studies. You will develop and apply your understanding of the central concepts and theories in journalism research, and examine journalism practice from a variety of perspectives. You will also develop graduate skills and a capacity for critical thinking and writing. How is public opinion formed? What influence does communication have on the creation and perpetuation of power relations in society? What is the role of journalism in democracy, and is it working? This module will enable you to identify and explore key concepts and debates in the critical study of politics and communication. You will file reports from your own local news patch, design newspaper and magazine pages, edit websites, master social media and develop shorthand to professional speeds. You will also study media law and investigative journalism. The climax of the course is the Critical Investigation: a lengthy piece of investigative journalism, developed in one-on-one tutorials over the whole year, with an accompanying essay. You'll be supported to complete a two-week placement in industry, and pursue your own interests and talents with specialist options including broadcast, magazine and sport journalism. Our modern newsroom is equipped with 40 computers that retract into the desk to form a workspace for editorial meetings. All computers have the Adobe Suite installed including Premiere Pro, InDesign and Photoshop. The newsroom also has five wall-hung screens showing Sky News and BBC News 24. Next door to the newsroom is the digital hub, with editing suites and mobile journalism facilities. Click to view a virtual tour of our journalism facilities. Overtime is run and produced by our journalism students. Originally developed with a focus on sports, Overtime now includes includes arts, current affairs and more. Check out the website, Overtime. Students also produce a 24-page magazine each year as part of their course, which is offered in print and digitally. What can I do on Overtime? You can get involved in subediting, choosing pictures, writing headlines and uploading material. You can also learn to produce video and audio for the site, and develop your multimedia skills. How will Overtime help me? The work you produce is an excellent showcase for potential employers. Plus, practice makes perfect – the more you write, the better you get, and Overtime gives you the chance to hone your skills throughout your degree. Ben Parsons joined the University of Brighton after a decade working for daily regional newspapers. He started out as an online sub-editor at sportinglife.com, before joining the North-West Evening Mail in Cumbria, becoming health reporter and then assistant news editor. As crime reporter for The Argus in Brighton, he covered serial killer investigations and Old Bailey trials. His work has also appeared in The Daily Telegraph and Racing Post. Ben has a BA in English, NCTJ certificate (qualifying as a Senior Journalist), PGCert in Learning and Teaching in Higher Education, and a Masters in Arts and Cultural Research. He lectures on modules in practical journalism, newswriting and law, teaches political philosophy for journalists, and supervises final-year projects. Ben also sits on the NCTJ Media Law examinations board. His research interests are in approaches to journalism training, and in public sphere theory. Simon has a professional background in both news and sport journalism. He is a fully NCTJ-qualified senior journalist who started his career as a news reporter with a regional daily, the Colchester Gazette, before moving into national newspapers with The Sun. Simon also runs a 20-session advanced journalism programme for industry professionals at Sky. Simon has worked in academia since 2009. His research focuses on journalism professionalism and he has had scholarly work published in Digital Journalism, Journalism and Journalism Practice. Simon has also written articles for The Conversation website. 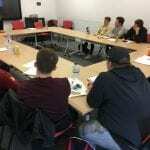 Owen is the Sport Journalism BA(Hons) course leader, a sports business academic and ex-professional sports journalist. He was editor for SportBusiness International magazine, the oldest magazine covering the business of sport, and covered major events including the 2012 London Olympics and the 2015 Rugby World Cup. Before that he was a news reporter for three years with Northcliffe Media, reporting mainly for the Surrey Mirror. 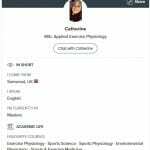 He holds a MSc in Sport Management and the Business of Football from Birkbeck College, University of London, and also completed his NCTJ pre-entry certificate from News Associates. Previously he has been a returning guest speaker on postgraduate programmes such as CIES (Centre for International Sports Studies) Fifa Master, The MESGO (Master of European Sport Governance) and Vrije Universiteit’s Master in Sport, Economics and Communication. Summer open day booking is open! Come and explore at the Eastbourne campus summer open day on Saturday 15 June: Get an in-depth look at subjects you’re interested in and the campus you’ll be based at. 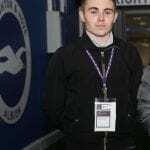 A University of Brighton student and graduate have scooped sporting jobs of a lifetime – reporting on Brighton and Hove Albion’s FA Cup semi-final against Manchester City at Wembley on Saturday. Sport Journalism third-year students heard about how women’s sport can be covered more responsibly as they visited Sky Sports on a field trip. We have a successful history in journalism subjects and this degree will open up career opportunities in newspaper, magazine, radio, television and online journalism as well as in public relations, copywriting and media management. Pass with 60 credits overall. Level 3 units in media, history or journalism preferred. At least 45 credits at level 3, with 18 credits at merit or above. IELTS 7.0 overall, 6.0 in writing and a minimum of 5.5 in the other elements. "I chose the course as I wanted to learn the techniques of journalism and obtain a qualification that would enable me to work in such field; it will provide me with an asset of specific skills that can make a difference compared to self-taught bloggers. "I enjoyed the intimacy of the course, the opportunity of having a close relationship with lecturers, quick feedback, the industry-level standards of teaching and having the opportunity to be taught by people who had previously worked in journalism. Staff were prepared, professional, inspiring and totally helpful - something I’m appreciating even more now that I’m on an MSc course in a bigger university. "I had a one week placement at BBC Sussex Radio. It was a great experience in one of journalism’s top firms - not the closest to my dream job but a valuable experience to understand how a newsroom works from the inside. "If you study on this course think of it as an opportunity not just to learn journalism but to practise it along the way. Set up your blog, develop your niche, and start contributing to as many publications as you can in order to have a portfolio of works that will demonstrate to future employers that you aren’t simply trained as a journalist but that you know how to do the job. "Be creative and don’t simply do the tasks assigned. Use your free time to develop your journalism-related skills: review gigs, exhibitions, set up a fanzine, etc. It’ll be worth the effort."